What's happened to global warming in the last 17 years and ten months? Since 1996, you ask (updated). When I checked my twitter feed earlier today I found a whole heap of unsolicited tweets from CJLB @orach24463_cj. I don't follow them on Twitter and as far as I can tell they don't follow me either. It looks as if I just got caught up in a response CJLB made to someone else. CJLB describes him or herself as "A conservative just musing about the incoherent dichotomy of the Liberal Mind - Seeking Utopia Begetting Hell". No, I can't figure it out either. What I can guess is that this is an elderly individual who is probably not highly educated formally, but with some self-education. I deduce that from their use of capital letters together with words of more than one syllable. I can also guess that they have opinions to the right of centre and probably a fair way right of centre. I'd also hazard a guess that they are religious, or have had religious training at some stage in their life. They might live in one of the "red" states in the USA. Maybe in the back blocks but not all that far back, because CJLB has discovered not only the internet but also Twitter. @MJIBrown @SouBundanga Is There A Real World experiment tht proves AGW Theory or that Stopping FossilFuel Use Will Mitigate #ClimateChange? Okay, that was a bit snarky. Heck, CJLB deserved a bit of snark. Here they were putting up silly diagrams and asking really dumb questions. It was as if they had a vast collection of denialist crap to parade endlessly on Twitter. One of the things CJLB was flogging was Christopher Monckton's RSS chart of temperatures in the lower troposphere. The one he wheels out whenever he writes one of his "17 years and 10 month" articles at WUWT. The point is that there are probably some people alive today (not many) who aren't aware that we are conducting an experiment on a global scale. The early results are already in. Adding vast quantities of carbon dioxide to the atmosphere makes the world hotter. It enhances the existing greenhouse effect because CO2 is a greenhouse gas. CJLB's question prompted me to update an old article. Last year I put up some charts to show how much the planet has warmed since 1996. Deniers are still claiming that it hasn't warmed, with the most common refrain at WUWT being "in 17 years and ten months". That brings us back to 1996. Here are the same charts as I showed last time, updated, so you can see what's happened since 1996. 1. Surface temperatures have risen. Surface temperature has gone up quite a lot, and stayed up. 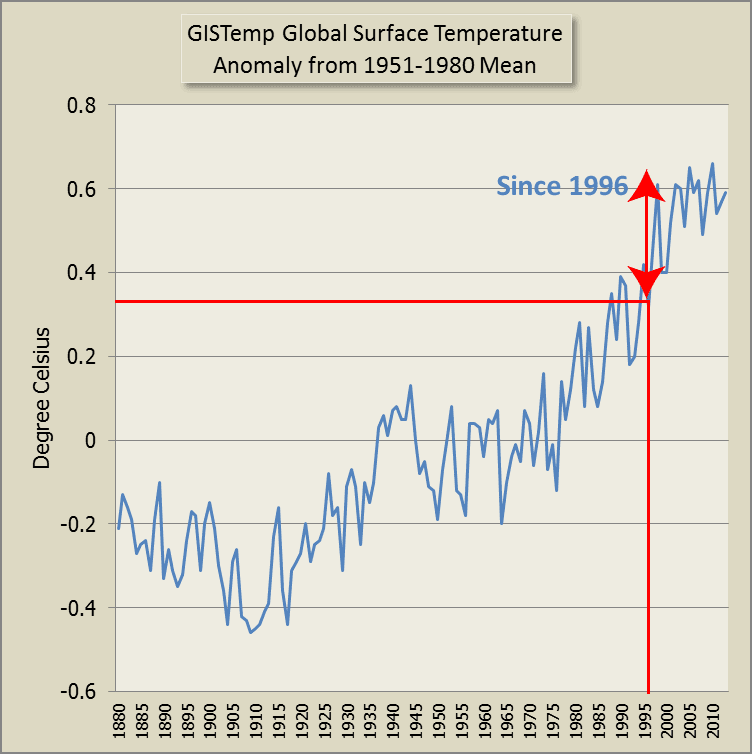 Here it is from GISTemp surface temperature anomalies, where I've marked 1996. If you're having trouble figuring out what the charts mean, I've prepared a short video that explains what you can glean from a chart of global surface temperature anomalies. You can see it here at HotWhopper or on YouTube. It should help with the other charts, too. 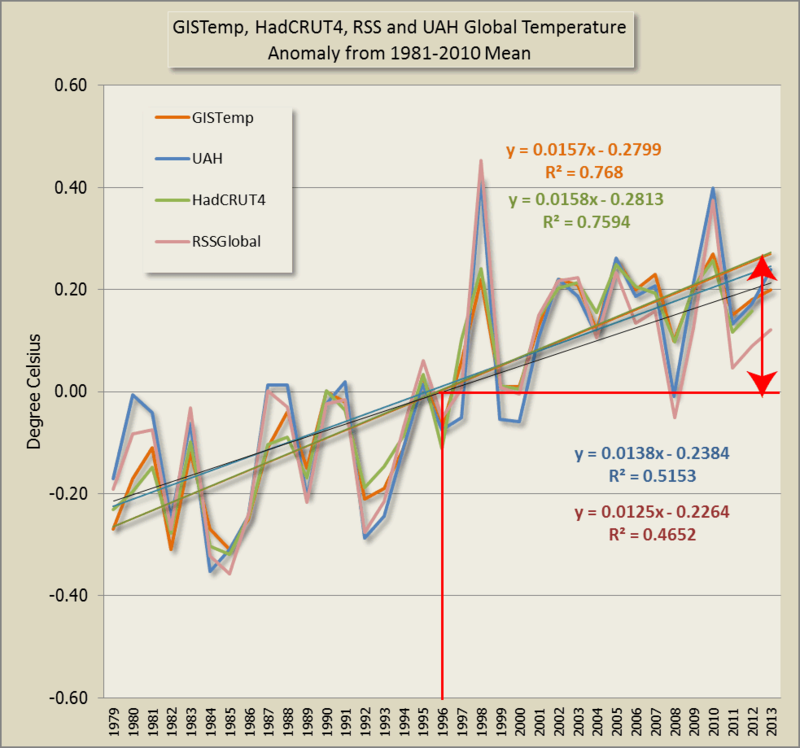 But of course, the AGW deniers will continue to cite it, because it shows the lowest anomalies, faulty or not. Flogging dead horses is what they're best at. It's all they've got at this stage. The 'great pause' is the centrepiece of the pseudoskeptic. To them it shows that global warming is a fraud and that the climate models are wrong. But let's have a look at the entire dataset shall we. The lower troposphere shows a trend of 0.124 K/decade. 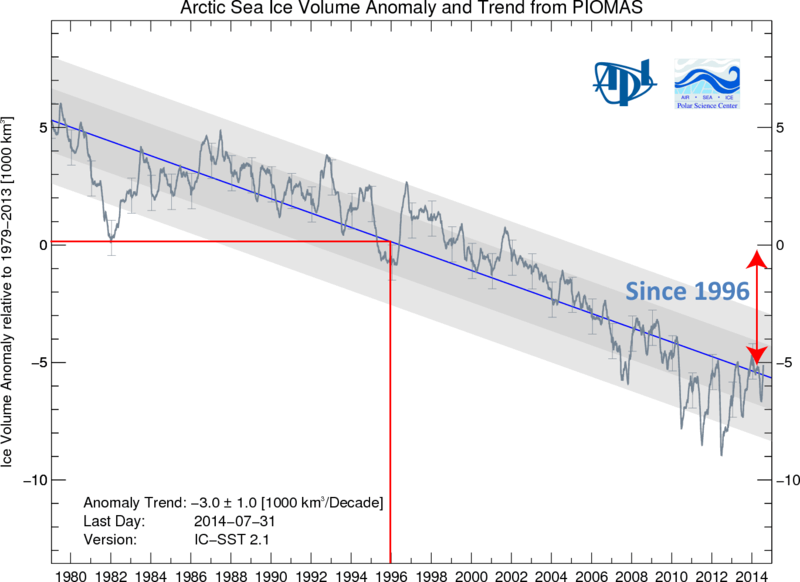 What the pseudoskeptic also will never point out is the stratospheric trend of -0.275 K/decade. Why? Because this is the signature of AGW. If global warming was caused by the sun, the prediction is that this trend would be positive. But it's strongly negative, showing that energy is increasingly being trapped. This one observation alone clearly falsifies their favourite alternate hypothesis. Physics and observations, make a mockery of the pseudoskeptic. But do the facts sway your typical pseudoskeptic? No of course not. Conspiracy theories sound so much more appealing. 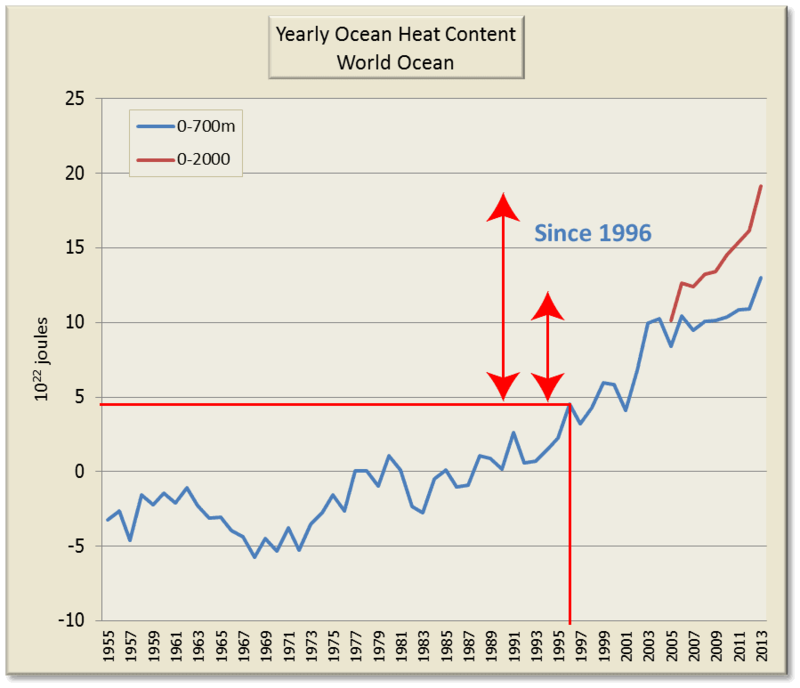 The "great pause" makes clear that global warming is no fraud. If the numbers were made up, there would be no need to fake a pause. 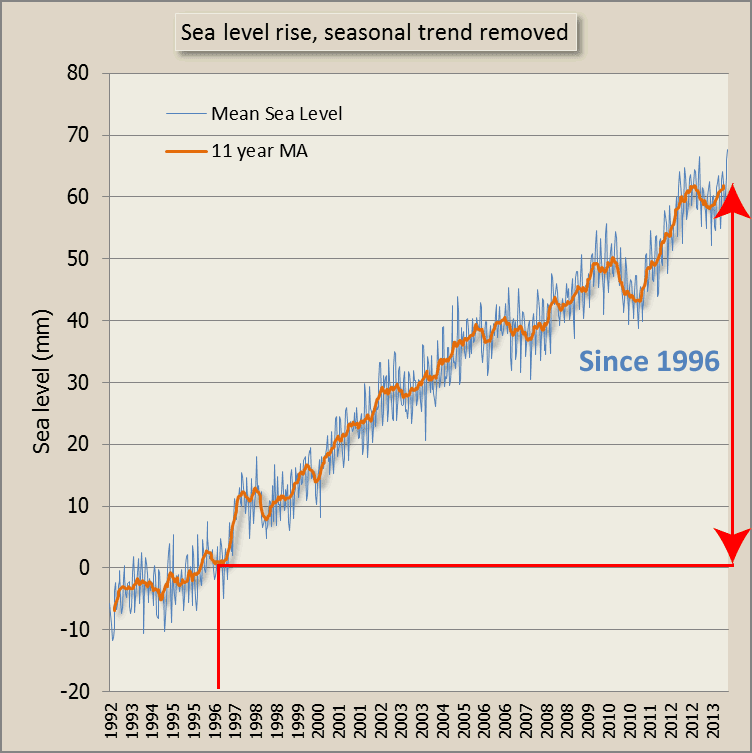 "The Great Pause" is merely the current centrepiece in the long list of denier centrepieces. UHI, Climategate, HockeyStick and Al Gore have all been centrepieces of the fake skeptic. In Science, a centrepiece falls and the theory falls with it. In fake skeptic "science", a centrepiece falls, only to be replaced with another factually unsupportable claim. "we are conducting an experiment on a global scale. The early results are already in." We'd better observe the climatic changes due to this unique experiment well. Future climatologists would never forgive us if we don't. It would be great to have a world-wide network of the quality of the US Reference network. Especially to observe changes in local extreme weather the normal meteorological network is not stable enough in time. That is also information we need to adapt to the climate change that is unavoidable. Does anyone have to political connections to make that happen? How do you propose a new idea into the international climate negotiations? CJLB seems to be one of those climate change denial twitter accounts that fires similar tweets and images at a variety of targets. In this particular instance Sou and myself. "@SouBundanga use of "#scam" & "#fraud" in debates on #science (#climate, #vaccines etc) seems anti-correlated with knowledge of science"
CJLB's numerous tweets have done nothing to change my view on that point. Not only have you found the missing heat... but you've also managed to disappear the 'pause' and create warming where there is none. An astonishing achievement and certainly worthy of a Nobel prize. I just plotted available data. It didn't take long at all and didn't require any research skills. All it needs is an internet connection, a spreadsheet and charting software - and the ability to use same. The data is from the links I provided. Skeptikal could do it too, if his or her commitment to climate science denial didn't prohibit such nefarious activities as looking up climate data. "Not only have you found the missing heat... but you've also managed to disappear the 'pause' and create warming..."
That is right Skeptical. You have summarised the bog standard accepted state of climate science. Careful. You may start being truly skeptical and living up to your name.